Most of us probably are surrounded by more clutter than we'd like. Before we know it, the books, papers, clothing and other detritus of everyday life make it difficult to find things we're looking for. In The Life-Changing Magic of Tidying Up, Japanese organizational expert Marie Kondo describes her KonMari method of tidying. Ms. Kondo has found, through many years of working with both business and personal clients, that straightening up your surroundings improves all areas of your life. Once you are free from the burden of too many possessions, your entire outlook on life changes for the better. Throughout the book, the author discusses her early life in Japan, when she was fascinated with lifestyle magazines and spent days organizing and re-organizing everything in her home (sometimes to the annoyance of her family). What a stroke of luck that she was able to turn her personal obsession into a job! Luckily for us, she has tried all the conventional methods of putting your possessions in order: clearing out one room at a time, doing a little bit every day, buying the latest and greatest organizers, etc. However, none of that really worked in the long term, so she had to develop her own system. Instead of doing a room or area of the house at a time, she found it's much easier to do a category (books, clothing, etc.). Her one criterion for keeping an object is simple, "Does it bring you joy?" If so, it can be kept. If not, it gets tossed. When I was describing the KonMari method of getting rid of anything "unjoyous" from your house to my husband, he was appalled. "You mean you just throw out everything? Think about what an environmentally bad idea that is!" he exclaimed. But the focus of this book isn't recycling, donating or re-purposing: it's clearing out the clutter. In fact, the author makes a good point about giving away unwanted possessions -- the giver will likely feel compelled to keep the object, since it was a gift (particularly if the recipient is a close friend or family member). In that case, you haven't blessed the recipient, you've just passed your problem along to someone else. I really liked some of the ideas in the book that were new to me. For instance, the purpose of an object may be in the thrill it gave you when you bought it. If you felt good when you initially acquired it, you shouldn't feel bad about getting rid of it even if it's never been worn/read/utilized -- it's served its purpose in making you happy. She also says when you get rid of an item, you should thank it for serving its purpose. She feels that items want to be useful to their owners and if an object is no longer serving a purpose, it will feel better in being discarded. So you don't need to feel guilty about throwing things away. Your possessions want to help you by giving you a less-cluttered environment. Some of her ideas, however, such as ripping pages with quotations you like out of a book and then discarding the book (an idea she later rejected) were a bit unsettling to me! 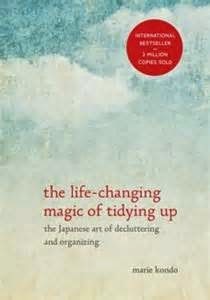 I enjoyed this book, although I think the subtitle, "The Japanese Art of Decluttering and Organizing" is a bit misleading. It sort of implies that Japanese people are just naturally more adept at organizing, the way the French are renowned for their cuisine or the Italians for their sense of fashion. The fact that Ms. Kondo had to do so much trial and error (and that she is in demand as an organizer in Japan) shows that while she happens to be Japanese, her methods are entirely her own! Disclaimer: I received a copy of The Life-Changing Magic of Tidying Up from Blogging for Books in exchange for this review. Nothing quit beats the feeling of getting something free for doing what you love.